We were with a group of six and rented a private van. Exactly in time the guide/driver collected us from our apartment in the city of Porto. The Mercedes van was brand new. We started with a trip of 1,5 hour to our first stop. A bridge over the Douro River. Sight seeing, beautiful landscape. Then a boat trip on the Douro river. On the banks of the river plenty of famous wineries. After that we visited a winery. White, rose and red wine tasting and self produced honey and olive oil. Nice ambiance. Time for the lunch. Another hour by car to the restaurant. 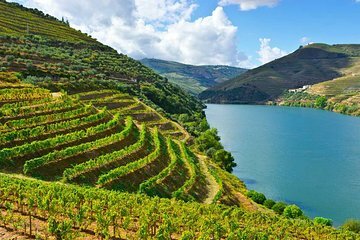 Again lovely views of the landscape of the Douro Valley. The lunch wasn't that very special. A bit disappointing. However, after the lunch we were invited to taste some great Port wines. White and red port wines. 10, 20 and 30 years vintage Port wine. Around 6 pm we were back in Porto. Some minor details: the lunch wasn't worth the money and the guide/driver used his mobile telephone during driving the van. So now and then we needed to correct his style of driving.